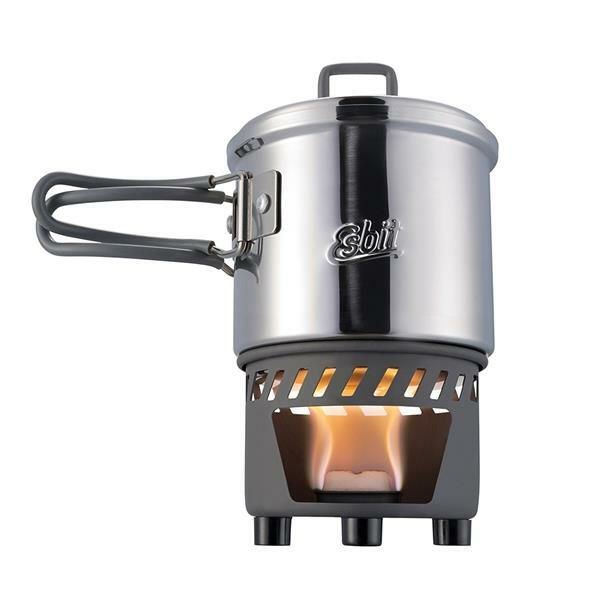 The Esbit CS985HA Alcohol Stove & Trekking Cookset provides various options for cooking out on the trail. It has a 985 ml pot with a volume indicator in ml/oz. increments on the side, and a 470 ml pot/pan which also serves as a lid. 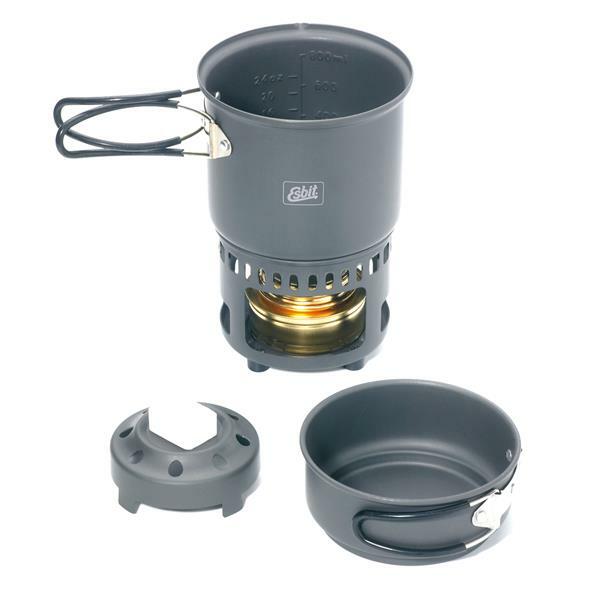 Constructed from extremely light, hard anodized aluminum, the set includes a stand that supports the pots, and includes a base for Esbit solid fuel tablets and a solid brass alcohol burner. 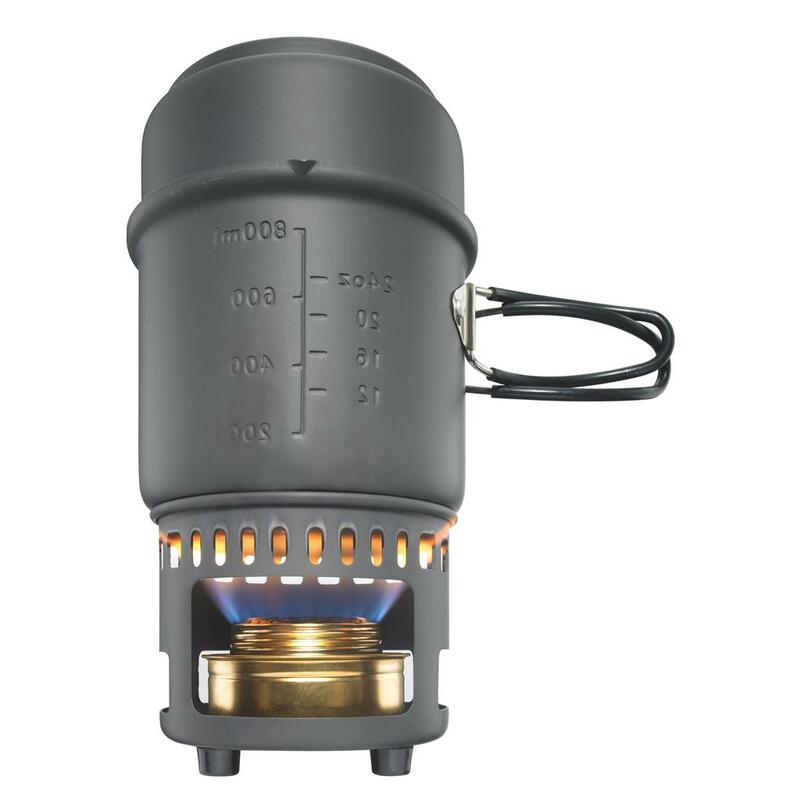 The alcohol burner is constructed from brass and allows variable temperature control, plus it holds the denatured alcohol in it during transport. Everything can be stored and carried in the large pot, which comes with a mesh bag, and fits compactly in your backpack. 985 ml pot with volume indicator in ml/oz. ; 470 ml pot that also serves as lid. Pots include 2 hinged, stainless steel, silicone-coated grips. Includes stand, 985 ml pot, 470 ml pot/lid, alcohol burner, and base for an Esbit solid fuel tablet. Pot stand, alcohol burner, and solid fuel base nest inside big pot. 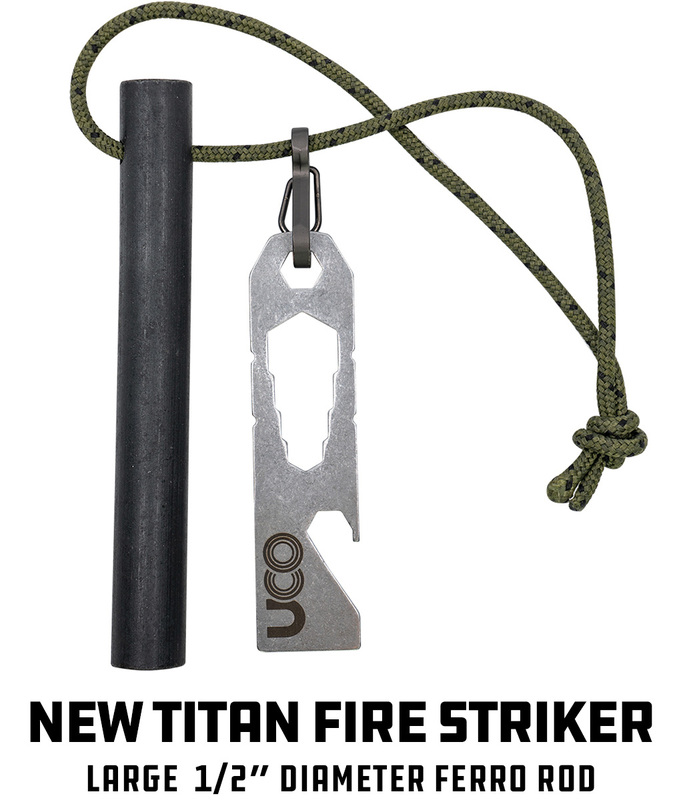 Constructed from extremely light, hard-anodized aluminum for efficient heat transfer. Alcohol burner constructed from brass with a screw top and rubber gasket. Alcohol burner has variable temperature control with a fold-away handle that helps to regulate or extinguish flame. Stores in included mesh bag. I took this set on a backpacking trip to the East Coast. I had to take a flight, and placed it in my multi-day pack as I have done with countless other cooking sets. During transport it was smashed beyond future use unless I hammered it back out. I have never had this problem with other cooking sets. When Esbit was contacted for a resolution, they stated that they would not cover the product and that I should contact the airline. HORRIBLE customer service to say the least. Im sure it was a manufacturing defect with a certain lot, but they didnt provide ANY resolution, and didnt take responsibility for their product. If you dont intend to treat this product gingerly, dont purchase it until they figure out any manufacturing defects. This is meant for play tea time with the kids in a safe environment not for the outdoors.